Middleburgh, NY (February 10, 2017) – They say that history repeats itself and that appears to be the case at The Middleburgh Telephone Company (MIDTEL). Nearly 50 years since its last acquisition, MIDTEL repeats history with the announcement of its purchase of The Newport Telephone Company (NTCNet) located in Newport, NY. 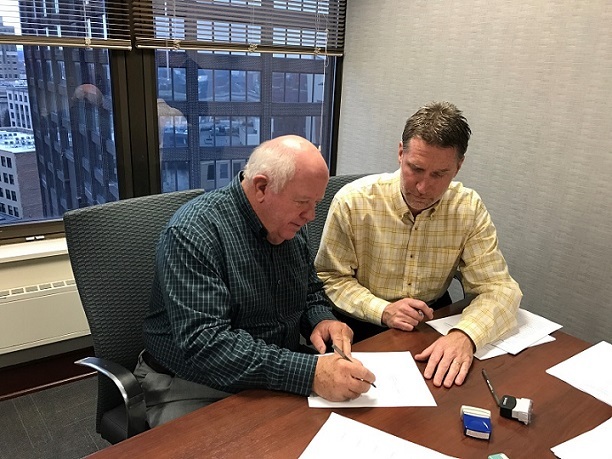 Pictured left to right: NTCNet President, Harley M. Ruppert and MIDTEL President, Jim Becker making it official. MIDTEL is no stranger to expansion, from the 1920’s through the 1950’s MIDTEL grew its service territory and customer base by acquiring small, neighboring rural telephone companies. Companies, such as The Fulton Valley Telephone Company, The Schoharie Valley Telephone Company, and The Oak Hill Telephone Company, amongst others. The last purchase was the Summit system in 1969. MIDTEL is excited to make this next step in its history and hopes this is the first of many steps in additional acquisitions. MIDTEL and NTCNet, with a combined 224 years of providing telecommunications services in upstate New York, joined forces on December 28th, 2016. The companies have combined what they consider their most important assets, their customers and employees, and plan to grow both companies using these assets. General Managers Joseph Tomaino of NTCNet and Jason Becker of MIDTEL agree that, “together the two companies are poised for a bright future. There are no personnel changes planned at either company, as there are great synergies with the talent and skill sets of the current employees.” NTCNet President, Harley M. Ruppert, shared, “this joining of forces of the two companies is very exciting and should benefit all – from our customers to our employees to the communities we serve and live in.” Both MIDTEL and Newport/NTCNET provide local, long distance, and broadband services in their franchised territory, with MIDTEL also providing Cable TV services and through their subsidiary companies, both companies also offer business communication services outside of their franchised service area through MIDTEL/MTLD and NTCNet. Both companies are dedicated to providing exceptional customer service, the latest technologies, and strongly believe in supporting the local community.